It doesn’t take a rocket scientist to figure out that Mama Nature is not particularly happy at this moment in time. The recent number of hurricanes, earthquakes and other natural disasters means that eco-friendly, sustainable products need to become the norm rather than the exception. I felt good about my contributions when we lived in Berkeley. We lived in a LEED-certified home with solar and lots of green features. But last year when we were on the road in an RV, we lived in a small space without a lot of “things” yet I think we were more wasteful than ever. Our limited kitchen space made storage and efficiency a necessity and we could have done a much better job using eco-friendly or reusable products. As I prepare to move into our new home and stock up on everyday essentials, I’ve been researching products that will help me in my endeavor to be more “green.” Today I’m sharing some of my favorite finds. We are a Franco-American household, therefore, we have A LOT of cheese in our life. Once we get our cheeses home Mr. Misadventures immediately takes them out of the horrible plastic that they are sold in (unless you are lucky enough to have a cheesemonger…) and wraps them for storage. 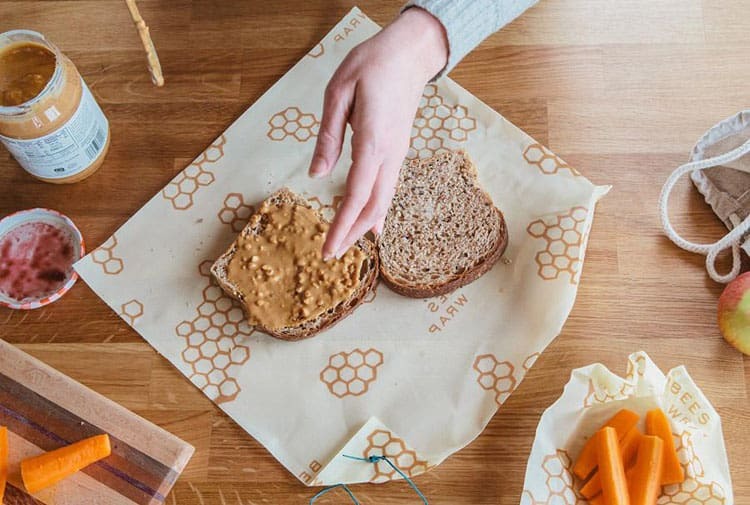 The problem is that many of the products used for storage are wasteful, and quite frankly not healthy, which is why I love the products from Bee’s Wrap. It’s also perfect for outdoor activities and picnics. BUY: You can buy it on the Bee’s Wrap website, but you’ll pay shipping. If you have Amazon Prime you can avoid those fees, by purchasing from Amazon. You may also find it at local organic shops. Another company making sustainable food wraps is Etee. They are using beeswax with essential oils, non-GMO soy wax, and coniferous tree resin along with organic cotton cloth. It’s a really great substitute for plastic wrap and will also work well for wrapping cheeses, fruits, vegetables, and meats. You can even freeze it! They are reusable and compostable and made in Toronto, Canada. I’m buying them to cover leftovers and wrap cheese, but you can also use them to pack snacks for a hike. BUY: You can buy wraps on the Etee website, but plan ahead, they are so popular that there is a 2-week delay before your order can ship out! I shudder at the amount of sandwich bags I went through as a child growing up! Not having kids, I’m not even sure kids still take a sandwich to lunch anymore, but if they do, I would implore parents to check out Stasher Bags. 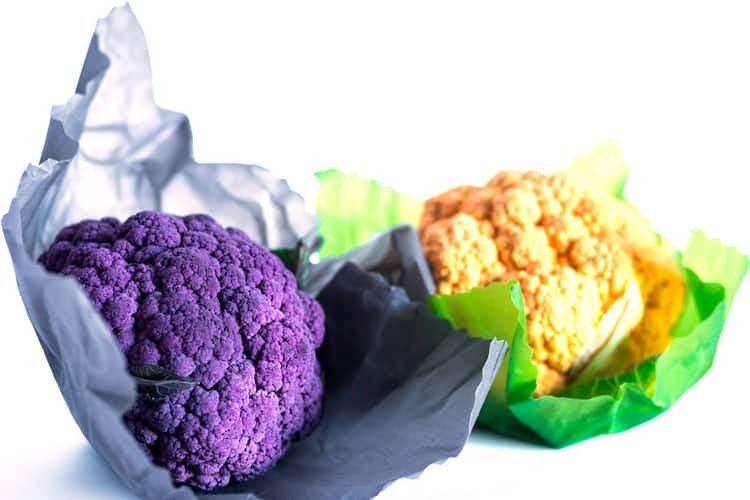 They have really cute designs to make it fun for children, but most importantly the pure platinum food-grade silicone has no harmful byproducts or chemicals. As for me, I’m getting the 1/2 gallon size. 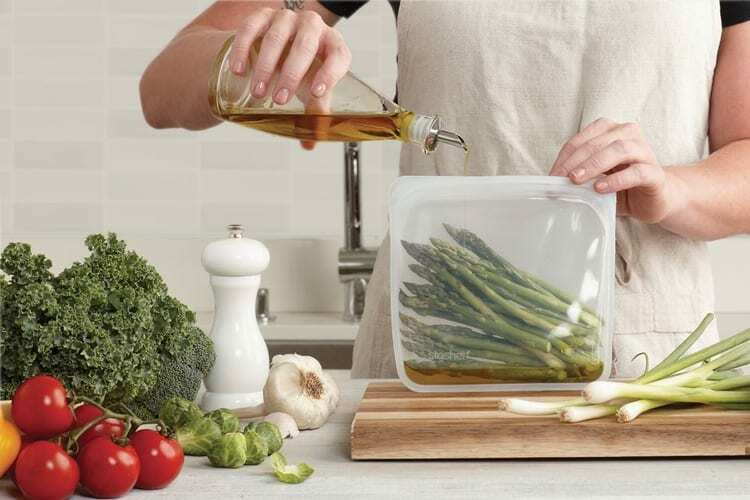 We marinate a lot and while glass containers are our preference, the refrigerator is usually pretty full which means I tend to use Ziploc bags that I can fit into tighter places. The Stasher Bag is going to give me the flexibility of plastic, but in a sustainable reusable format that goes from fridge to microwave (although we don’t own one) to stove top and then on to the dishwasher! BUY: You can buy these on the Stasher Bags website, but you’ll pay shipping. If you have Amazon Prime you can avoid those fees, by purchasing from Amazon. You may also find them at The Container Store. When I first saw these bags online, my first thought was “oh cool!” because I am Type-A and love organization. I could just imagine how quickly I could unpack our groceries if everything was pre-sorted from the moment it left the store! But then I realized the environmental implications of people not using plastic bags and I knew I had to share this one. Being from California where laws have forced stores to ban the use of plastic bags (and where they charge you for paper bags), I am long used to bringing my own bags, but on our travels through the US last year we were so surprised to learn that these laws are not very prevalent. Maybe the benefit of efficiency will drive more people to products like these. BUY: First spotted in an ad from Deal Snatchers, but I found them cheaper on Amazon (including one with a freezer bag! ), plus with Prime there are no shipping costs. I remember one of the first sustainable products I promoted on Misadventures with Andi. It was a reusable shopping bag from Joey Totes, the company still exists today and I still have the bags! Given it was way before the no-plastic shopping bag laws in California, this company was ahead of the curb trying to promote eco-friendly products. Shopping bags have become omnipresent, but what about backpacks? I really love this brilliant backpack from Onya Life made from recycle old plastic water bottles that have been turned into fiber! It scrunches up into practically nothing and fits into a tiny bag you can throw into your suitcase. It is perfect for days in the city when you don’t want to carry a purse or when you are on a roadtrip and decide to take an impromptu hike and you just need something light to carry you water, sunscreen and snacks. 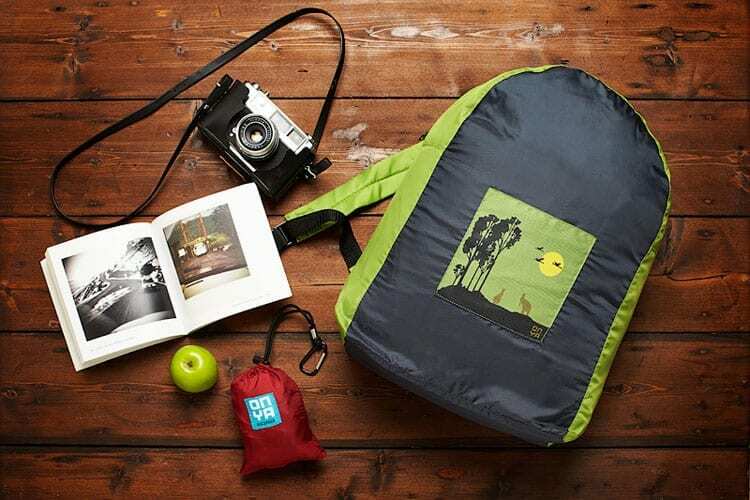 BUY: You can get this backpack on Onya Life’s website, but be aware that it comes from Australia. Still, shipping isn’t too terrible. 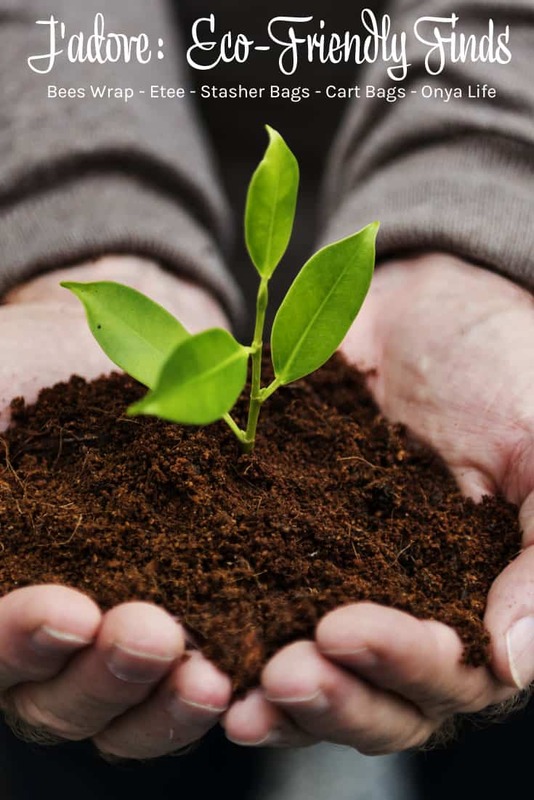 You can always purchase a carbon offset to make up for it. How about you? 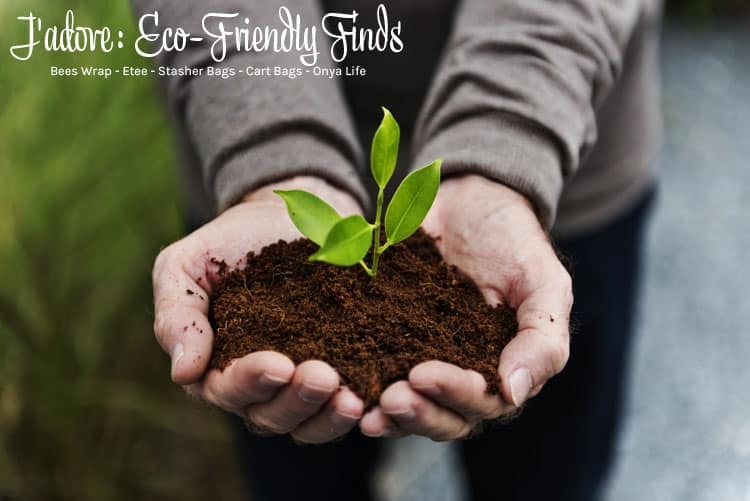 Do you have an eco-friendly find that you are currently adoring? Do share! These are some amazing finds! 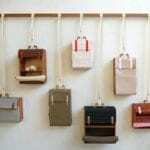 I’m interested in all of them, especially the stasher bags! We use too many ziploc bags in my house and I absolutely hate them. I’m in Texas and our grocery store bags everything in plastic, too, and I hate those also. I love these finds! The stasher bags are a really neat idea. I am going to have to look into them more. 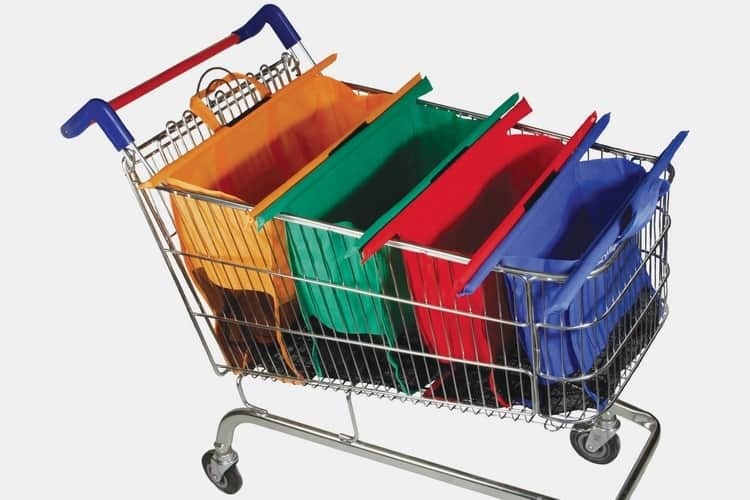 Those cart bags are such an amazing idea! I love them so much. I am going to have to check them out further. These products are so cool and much better for the long term care of our environment. I think those cart bags are needed in my life. It really speaks to my TYpe A personality! The eco food wraps are really interesting and absolutely new to me. We are actually the first here in Goa to get all eco things but that’s still missing and would work well here. By the way have you heard of nettle nut leave plates. Those are super common in India. Great stuff, thanks for the share, I like to be eco friendly. The stasher bags are pretty clever and I’d probably use the Bee’s Wraps quite a bit. These were some good finds! I already bring bags everywhere I go, but those cart bags are calling my name! Just last week a cashier bagged all my pantry items in my cooler bag, which I had to empty to put all my freezer items in. Those cart bags would sure help that from happening again! I try to use reusable items whenever possible. I have been thinking about trying something like Bee’s Wrap for a while now. I love these suggestions so much! I try really really hard to reduce the amount of plastic we use, especially NO STRAWS and such, but prepping food for lunches is a challenge. I will definitely look into the packaging you shared to try to cut down on sandwich bags. Thanks for these suggestions. We also bring our own bags when we shop. I have a small collapsible shopping cart in the trunk of my car. It may seem like just a little thing but reducing the use of plastic helps a lot to save the environment. Bee’s Wrap sounds exactly like what I’ve been looking for. I’m trying to get rid of plastic where ever I can. Those are some unique finds. I don’t have any eco friendly products I really like. I just started looking for them though. The Amazon link is the best price I have seen for cart bags, I need to order them, I already use reusable bags but I like the way these fit in the cart.